Propeller Anime: Four Years of Awesome Times! Thank You! Four Years of Awesome Times! Thank You! Yup! 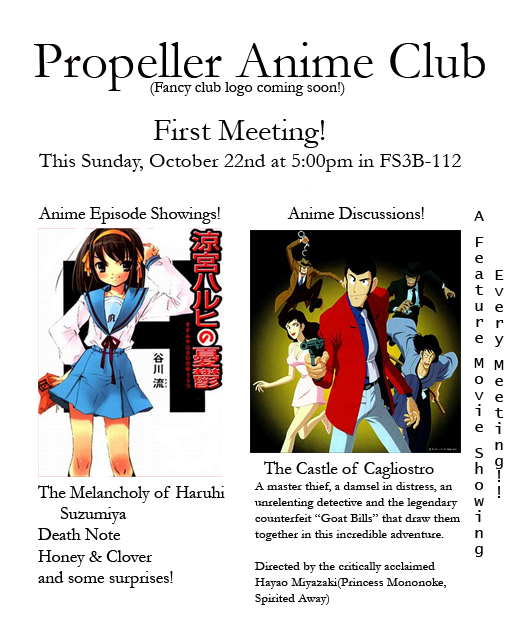 That is the first ever flyer for the Propeller Anime Club! Four years ago was the very first meeting the club ever had! ﻿We never actually showed Castle of Cagliostro that day because I could not acquire it in time and substituted Nausicaa of the Valley of The Wind instead. I also love the note about getting a club logo soon, because it took more than three years for our club to finally have one! Death Note was new at the time and half the people who came left after the first episode because they thought it was boring. I am sure Hot Topic would later change their minds! Great times indeed! From my perspective, running Propeller Anime Club has been a really fun, learning experience. It all started from seeing students on the Full Sail forum wanting an anime club and at the time I was an instructor so I decided to found the club and be its faculty sponsor since anime has been a big part of my life. The club has come along a very long way since 2006 and we've done a lot of awesome stuff since then and have shown a lot of cool anime! The club has stood as a place to hang out and watch some awesome Japanese cartoons and we've done pretty good in sticking to that! The last year has been especially interesting with a large focus on showing essential classics to the youngest generation of club members we've ever had! It's very awesome to see that anime of at least 20 years old can still be appreciated by the modern anime fan! We've also mixed in some excellent contemporary anime and over the past year and I think our palettes in anime preferences has expanded, wouldn't you say? Speaking of the future, we'll have many awesome events planned so we can all get to know each other better, create new friendships, strengthen existing ones, and make fun memories! Tomorrow, we shall celebrate our fourth year anniversary with fun, games, prizes, treats, and costumes! We'll also be watching a horror anime that is totally WICKED and may scar some of you for life! If you haven't been to a meeting in a while or at all, you are just as welcome to come as all our regular members! In fact, some of the members you will meet have joined on a past anniversary of the club! In a couple weeks, we will be attending Orlando Japan Festival which will be lots of fun! Members have proposed some awesome event ideas and in the future, there will be dodgeball, Rocky Horror Picture Show, another hangout with Anime Spot, and perhaps a version of the Ninja Olympics that takes place outside of a convention! Needless to say, there is a fun-filled future for the club. From the bottom of my heart, I thank everyone who has been a part of the club and has supported it over the last four years. 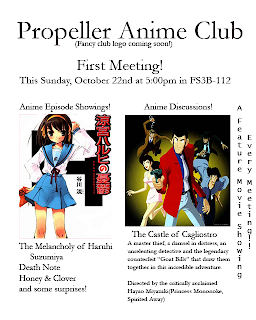 I can say with full confidence that we define what an anime club should be. It's been a blast for me and it would not be possible without you guys being involved! Next meeting on Saturday, November 6th! Recap of the last meeting! 10/24/10 edition! Recap of the last meeting! Binary edition!